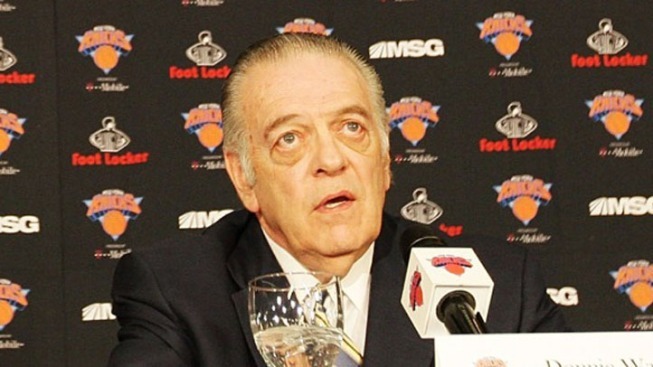 Donnie Walsh will not return as president of the New York Knicks, who must find someone else to continue the building job he started. The 70-year-old Walsh said he decided Thursday that he wasn't up to Dolan's request that he stay on for at least two years. "I wasn't sure that I wanted to go and devote myself multiyear. On the other hand, I understand why he would want that," Walsh said on a conference call. It also opens questions about whether coach Mike D'Antoni will return for the final year of his deal, though Walsh indicated D'Antoni would stay. "I know that he is the guy that can take this team to the next level," Walsh said. "Mike wants to see the job through." Walsh apparently would have been back had he been willing to agree to stay for at least a couple of seasons, especially since the next one is in jeopardy because of the NBA's labor situation. But he has battled health problems and was separated from most of his family, who remained in Indiana when he came to New York. "I do miss my wife and my family, and this is a 24-7 situation, as a lot of GM situations are. This is even more intense," Walsh said. "I'm running out of energy." Walsh spent three seasons in New York, leading a massive rebuilding effort that got the Knicks back into the playoffs this season following the acquisitions of Amar'e Stoudemire and Carmelo Anthony. But Dolan didn't pick up his option for next season, and the two couldn't agree on terms of an extension. "In a relatively short time with the Knicks, Donnie made a tremendous impact, which will be felt for many years to come," Dolan said. "We thank Donnie for his leadership, hard work and many contributions to the revitalization of the team." Walsh arrived in New York following the 2007-08 season and immediately went to work cleaning up the mess left by Isiah Thomas. That meant spending two seasons reducing one of the league's highest payrolls, getting the Knicks far enough under the salary cap to afford two top players last summer. Walsh had said he wanted to return to make them, but his desire lessened as time went on, realizing that he couldn't do the job at less than 100 percent. But he's satisfied that he made enough steps to get the Knicks moving forward again. "I'm not bailing. I do have the team where it is," he said. "I understand that the franchise needs a commitment for more than one year." "I don't think Isiah Thomas had anything to do with basically anything I'm doing now," Walsh said, calling reports of Thomas' involvement "an annoyance." He brought professionalism to a Knicks organization that had become an embarrassment on and off the court during Thomas' reign, unloading some of the burdensome contracts that hindered them for years and relaxing the team's media policies. "I think I did that," Walsh said. "I think I did the first step of that."